Helium is the rarest common element. Out in the Universe, 25% of all matter is helium. Yet on Earth, this abundant element has gone missing. It should be in our air, but it isn’t. Helium is so rare, it is the only element to have been discovered in space before it was known on Earth. But once you know where to look, it can be found on Earth. It sits in natural gas reservoirs. A little helium is also present within the rocks in the crust and mantle. When you find helium escaping from the ground, something is happening underneath your feet. Tread carefully. Helium is best known from toy balloons, and more serious floating devices such as blimps and weather balloons. The second familiar application is to make voices go squeaky. The biggest use of helium (30%) is in cryogenics. Helium stays a gas until very low temperatures (4K above absolute zero) making it useful in refrigerators which reach these temperatures. Below 4K it becomes a liquid (never a solid), and liquid helium is a super coolant for superconductors. 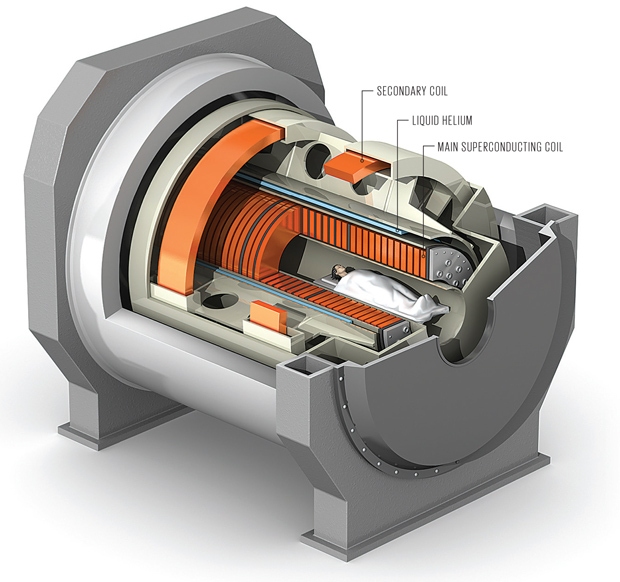 Elsewhere, helium is used in manufacturing electronics components. Used for breathing purposes, in diving it help avoid decompression problems and allows people to dive deeper. In MRI, breathing in helium helps imaging the inside of lungs (and of course, the MRI itself uses helium for cooling of the instrument). A more mundane modern use is in air bags (together with argon). The use of helium for toy balloons could be seen as a waste of a valuable, non-renewable and increasingly scarce resource. The word ‘helium’ comes from helios, for the Sun, and refers to its discovery in the Sun where it is abundant. It is present in our atmosphere at a level of 0.00005% which is almost undetectable and certainly unusable. Barring a quick collecting sortie to the Sun, where can we obtain our helium? The answer was found by accident. Oil wells produce gas as a by-product, and this gas is (wastefully) burned off. An oil well in Kansas (where else?) produced gas that would not burn. The non-flammable gas was send off for analysis. The ‘problem’ turned out to be that the gas contained too little methane to burn. Most of the gas was (inert) nitrogen, but about 2% turned out to be helium. The helium had nothing to do with the unflammability! Yet, because of this accident we now know that helium occurs in natural gas fields. Helium concentrations in natural gas reservoirs is typically 0.1-0.5%. It is commercially extractable above 0.2%. But the gas fields around the Oklahoma Panhandle region contain ten times higher concentrations. Worldwide production (or rather, mining) of helium is 175 million cubic meters per year, mostly in the US. Annual consumption is in excess of 200 million cubic meter. The difference is made up by the US National Helium Reserve, which is expected to run out in 5 year time. There is indeed a definite need to develop new sources. The true economic cost of the helium in that toy balloon could be as high as 50 pound; the actual price you pay is based on the expectation that new helium resources will become available. This year, a major find of helium in the Tanzania rift valley was announced. The volume mentioned in the press release corresponds to 8 year of worldwide consumption. It is a start. Helium is a noble gas. If you remember your chemistry, chemical reactions work by using empty locations for electrons, and helium has a filled electron shell – there are no vacancies. So it does not react with other atoms and does not form molecules. Under extremely cold temperatures it can become a liquid, but those temperatures are not reached anywhere outside of specialist laboratories – not even in space. (In space, no one can hear you sqeak.) (Bad pun alarm.) As a noble gas, you would expect it to reside in our atmosphere. Indeed, another noble gas, argon, makes up 1% of our atmosphere. But no helium. Why not? The problem is that it is too light weight. At room temperature, helium atoms fly around at speeds approaching escape velocity. Over time, and not much time, it leaks away into space. The minute amount in our atmosphere, compared to the 25% in space, shows how hard it is to keep hold of something moving at escape velocity. So where does the helium in natural gas come from? Even a noble gas can get caught within the rocks of the Earth. At the time the Earth formed, there was still helium around, and some of this was caught within the forming Earth. A very small amount only, though. It has been there ever since, stuck within the crust, mantle and core of the Earth, unable to get out, fleeting spirits caught in our planetary prison. The Earth has a second source of helium. Radioactive decay of uranium and thorium produces helium as one of its decay products. (Alpha particles emitted by radioactive elements are in fact helium atoms.) The radioactive elements are part of the Earth and their decay has slowly added helium to the Earth’s interior. In Australia’s Koongarra region where uranium deposits exists, the ground water near the uranium is strongly enriched in helium, arising from the nuclear decay. The helium captured within the rocks can be released when these rocks fracture or melt. Once released, the very buoyant gas begins to diffuse upward. Two common rock types are impermeable to helium: anhydrite and salt, and the helium collects below layers of these. The same layers can also capture natural gas. Helium being lighter than natural gas, collects in the upper levels of these gas reservoirs. If not intercepted by these layers, the gas eventually comes to the surface. This happens above regions where the Earth is disturbed and active: in rift zones, in earthquake regions and in places of active volcanism. 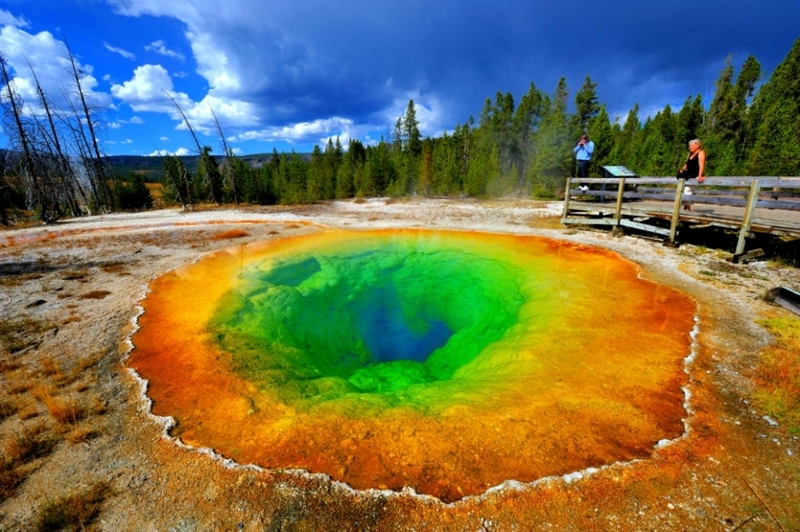 An example is Yellowstone, which leaks an amazing 60 tons of helium per year. That is a lot and suggests that the Yellowstone hotspot has picked up helium from a reservoir in the crust. The heat of the hotspot released the helium, probably beginning about 2 million years ago. (Do the geysers sound perhaps a little bit squeaky?) The Tanzanian helium reservoir was also found from the high helium (and nitrogen) emission from the ground. This release of helium is a common feature around volcanoes. Take for instance the eruption near La Restinga on El Hierro, in 2011. (This volcano was named Bob on VolcanoCafe, for reasons lost in history.) 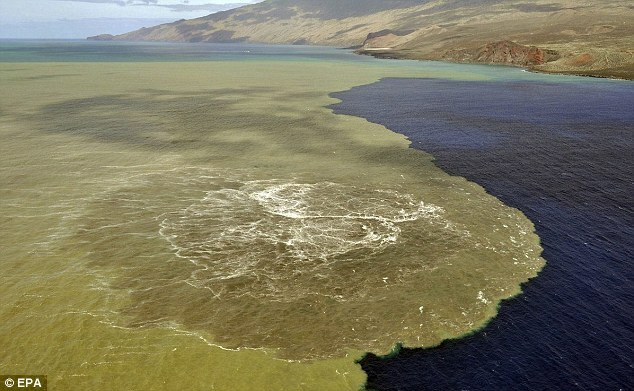 Extensive gas measurements were taken on the island in the air and in ground water before and during the eruption (although analyzed only later): these showed that helium emissions began to increase one month before the eruption began. Helium occurs in two isotopes. The normal one is He-4, consisting of 2 protons and 2 neutrons. The rare one is He-3, with 2 protons but only 1 neutron. In the Earth’s atmosphere, He-3 is extremely rare: it accounts for only 0.0001% of all helium, i.e. 0.0001% of 0.00005%. He-3 is so useful and so rare, it is one of the most expensive substances on Earth. As so little can be mined, it is made in nuclear reactors and obtained from decommissioning nuclear bombs. About 10 kg is produced each year, and it sells for more than a million dollars per gram! The helium emitted by Yellowstone contains 10 times the fraction of He-3 of the atmosphere. Within the 60 tons of annual Yellowstone helium, there is 0.5 kg of He-3. This is a billion dollars going up in smoke each year! It could pay for all scientific research into volcanoes in the world, with enough left to pay for dinner for all VolcanoCafe readers. And volcano research would still turn a profit. If only we could catch it. Radioactive decay in the Earth produces new He-4, but no He-3. At the same time, helium continues to be lost to outgassing into the atmosphere. The result is that the ratio of He-3/He-4 in the Earth goes down over time. In places where the original helium has been lost, all the helium is radiogenic (i.e. produced later by radioactivity) and there is little or no He-3 left. Where there is more primordial helium, left over from the Earth’s formation, there is a higher fraction of He-3. In regions where the crust is very stable, such as Britain, the helium from the ground is almost entirely radiogenic: less than 1 per cent is original. Continental plates are highly processed. In Greece, more tectonically active and prone to magma movement, more of the helium is original. In spreading ridges, the fraction of He-3 is quite high and much of the helium is primordial. About 70% of global He-3 emissions come from mid-oceanic ridges, where mantle material comes to the surface. Clearly, He-3 comes from the mantle. This shows that the mantle still has a lot of material that is original, which has not mixed with descending continental plates or been at the surface before. The high fraction of original helium in the mantle also suggests that there is rather little uranium and thorium there. Most of Earth’s radioactivity may be in the crust. An application of He-3 comes from the African rift valley. The He-3/He-4 ration measured in ground water in the Afar region of Djibouti, where the hotspot hit 25 million year ago, is 10 times higher than that in the atmosphere, showing that the hotspot brought up volatiles from the mantle. The same ratio is found in the nearby stretch of the ridge valley in Ethiopia. But further away, in Kenya, the He-3/He-4 ratio is close to that in the atmosphere, and here the helium comes from the crust. The helium in the rift valley in northern Kenya, close to Ethiopia, is intermediate in composition. The African rift is different in different places: in the north it is driven by mantle heat, but in central Africa it is crustal extension without involvement from the mantle. Here, helium balloons are used to sample airborne ash from Karymsky volcano (Kamchatka). Let’s go back to Yellowstone. It emits a lot of helium with a lot of He-3. What does this tell us? The large amount of helium suggests there is a captured helium reservoir underneath Yellowstone. This must have formed a long time ago, well before the hotspot arrived. The amount of He-3 shows that the helium in the reservoir came from the mantle, and not from the crust. How long has it been there? In theory we could date it from the He-3/He-4 ratio, but in practice this depends on too many uncertainties. It may have been there a long time, perhaps a billion year, but take any precise age with a large grain of salt. How about helium and El Hierro? In 2003, long before any volcanic unrest, the island emitted 9 kg per day of helium. In July 2011, just after the deep earthquakes began, it had increased slightly, to 11 kg/day, with a three times higher fraction of He-3 than in 2003. In mid September, helium emission increased to 24 kg/day. Two days later, the seismic crisis started and the on-going earthquake activity migrated to the south of the island. The eruption began on October 12. Helium emissions peaked in November, before slowly declining again. What happened? The increasing pressure of the inflating magma reservoir caused small cracks to appear in the rocks. It was a type of volcanic, self-induced fracking. The cracks allowed the helium to escape and make its way to the surface. CO2 can do the same and it also used to measure ground emissions, but helium can diffuse more rapidly and is not affected by biology: it is the more powerful tracer. The isotopic ratios show that the helium which heralded the El Hierro eruption had a mantle origin. A final explosive example is Ontake, Japan, which unexpectedly erupted in September 2014 killing a number of tourists. It was a phreatic explosion, without any precursors or warnings. But in the beginning was helium. From June 2003 until November 2014, helium emission close to Ontake, but not at more distant sites, showed an increasing fraction of He-3. In hindsight, this indicated a re-activation by newly arrived magma over a decade, which increased gas pressure near the surface, culminating in the sudden explosion. There may be more to come. which are purely caused by moving water. But not all helium refugees foreshadow impending volcanic eruptions. The Oberpfalz in Germany is not an active volcanic region, however the helium here has a higher than usual He-3 fraction, which is different from the rest of Europe. Mantle helium is managing to find its way to the surface. The region, around the Bavarian forest, is part of an ancient mountain belt, an old stitch running across Europe, where two parts of the continent came together. Is this region about to be reactivated? Or was mantle helium trapped here around the time of the continental collision? The latter seems more likely. Not far away is Joachimsthaler, a town in a valley with old mines. It was an important source of valuable metals; the name has left imprints in our language. 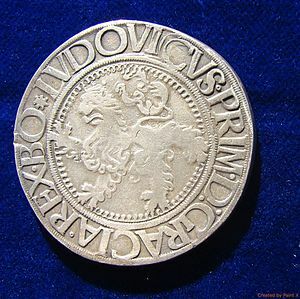 Coins made out of its metal became known as ‘thaler’, a word that survived in Europe in the names of various types of currency. 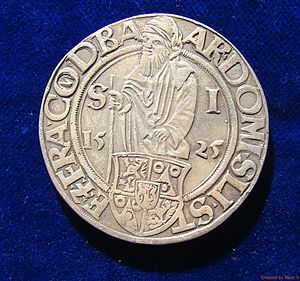 Before the euro, it remained in use in the Netherlands for a 2.5 guilder coin. In the US, ‘thaler’ became ‘dollar’; in this form, Joachimsthaler still rules the world. Helium does more than just announcing impending volcanoes. It also makes money. Scroll down to Lassen county area…Underneath Herlong Ca. Motel was run by Rod Serling.. The whole region appears to have had a busy week….. Interesting. Thanks for the article, very nice. Monitoring is useful when there is found a change in numbers, and those can be related to events. Is monitoring of gas emissions (He, CO2) around volcanoes ‘normal business’? As earthquakes, tremors and movements of the crust. Or only done occasionally? It is becoming an interesting August. There was an M6 earthquake near Iwo Jima (Iwo Ioto) today. A very deep one, nothing to do with the island, and probably not strong enough to affect the magma chamber. Still..
Am I reading this right and are Vestmannaeyjar sinking? Have they perhaps lost all their helium there? The Icelandic Met office has given the explanation it is accumulated dirt on the GPS antenna. A quick google shows that Hekla stands for three elements in the periodic table: Helium Potassium Lanthanum. But assuming you mean the mountain, I found CO2 monitoring from a gas detector installed on top of Hekla in 2012, but nothing on helium. I guess you could do that with a few others too. Some would be difficult. Dubbi? Fuji? Depleted Uranium, boron, boron, iodine. OK, bit of a stretch on that first one. Fluorine, uranium, and that’s when you get stuck, no J or JI element. Depleted uranium is only half an element.. good one though. May I help out with a Deuterium? Jodine was a previous name for Iodine – that may help. Jargonium was an element at one point: it is now known at Hafnium. Something seems to be happening at VON this afternoon; looks like some kind of activity. I think they were servicing the stations. operation was safe and very few accidents. Interesting site about LTA operations..
OK I’m an frustrated Airship Captain..
You’d have a hoot at the Naval Aerospace Museum in NAS Pensacola. As you are walking along looking at the exibits, you run across an airship gondola…. just out of reach. In the main exibit area, there are a formation of Blue Angels hanging from the ceiling. Full sized. The A-4 airframe if I remember correctly. Hey lurk my post got eaten. Looks like they may be on to something there..
Years ago I worked at this little airfield as an instructor. Could have been worse, could have been Chicago. Bard got a green star 3hrs ago. Another star at Bard 1/2 hour ago. Screen cap from IMO’s site. As long as they don’t connect… it should be fine. … which reminds me. I Think they should do a summer Olympics in Iceland. Could you imagine having a 500 meter Jökulhlaup dash or a Holuhraun cross country race? It would be epic 😀 . Probably need a lot of medics to deal with the falls… lava fields aren’t as forgiving as deck non-skid coatings on a ship. Connected via the MAR. They appeared to start in TFZ, now Vatnajökull. Where next? Myrdalsjökull? Apart from being situated on the MAR, these events are probably not related at all. The magma chamber beneath Bárðarbunga is being refilled after the Holuhraun eruption. This slowly pushes the plug that subsided during the eruption back up. The movement causes earthquakes along the ring fault. It seems that the ring fault mainly locks up in the north and south sides of the caldera. Whenever the accumulated strain on one side is released by an earthquake, more strain ends up at the opposite side. Usually that means that a large quake on the north side is followed by activity on the south side in the hours or days following the first quake. Today’s triple action on the south side matches the recent M3.95 on the north side. If the stress relief were uniform, that would be my guess, but Iceland has shown to be quite chaotic in where the rift failures occur and doesn’t seem to like patterns any more than a volcano’s dislike of schedules. Is it possible to estimate the refill rate of Bardarbunga based on the seismic moment of these quakes? We’ve got a calibration of the scale from the Holuhraun eruption in the graphs of GPS height and accumulated seismic moment. Its also a bit more clear how big the plug is these days. Worth a go? Looking at the first two weeks of the eruption, there were 11 M5+ quakes at Bardarbunga and this gave 6m of subsidence. So that’s roughly 0.5m per M5 quake. An M5 quake is 10x bigger than the recent M4 quakes. So each M4 is about 5cm of plug rise by that crude estimate. Recently we’ve seen an M4 quake roughly once a month. So, I guess the refill rate is currently about 5cm per month. To push the plug back up 60m is looks like a century of refill time at the present rate. Is that a reasonable approach? If the ‘piston’ were completely decoupled from the surrounding landscape and acting as the pressure relief for the Bardarbunga system I’d expect the surrounding GPS stations to not lift. However, it looks like there’s about 10mm per month lift in the surrounding landscape. I think that could mean the rise of the plug is not enough to release the pressure of the recent deep magma influx. But then those GPS signals look pretty small to my eye. How probable is this theory with the plug being pushed back up? It’s hard for me to imagine that a huge plug like the one of Bardarbunga can be pushed back up as a whole. Isn’t it more likely that the plug is still going down / re-adjusts at its new location? For pushig the plug back up there needs to be serious pressure, which is, to my mind, more likely to find a different way out. Local uplift within the caldera/plug is a different story though. I don’t think the entire plug can/will be pushed back up. Pressure underneath will most likely I think cause smaller eruptions somewhere in the system. Like here at Katla, you can see the caldera rim, but it’s filled with smaller eruption sites instead of the roof being lifted back up to it’s original location. Quick post on the activity in the Tjörnes Fracture Zone is up. Pingback: Helium Crisis Update | 802701 A.D.